FOODMatch | Look North Inc. Copyright 2017 Look North Inc. All right reserved. All work copyright respective clients. A business-to-business website that highlights quality products and industry expertise. Founded in 1996, FOODMatch is a producer and importer of speciality Mediterranean foods with a focus on bulk and retail olives and antipasti. They deliver superior quality, compelling packaging, industry innovation and exceptional value. 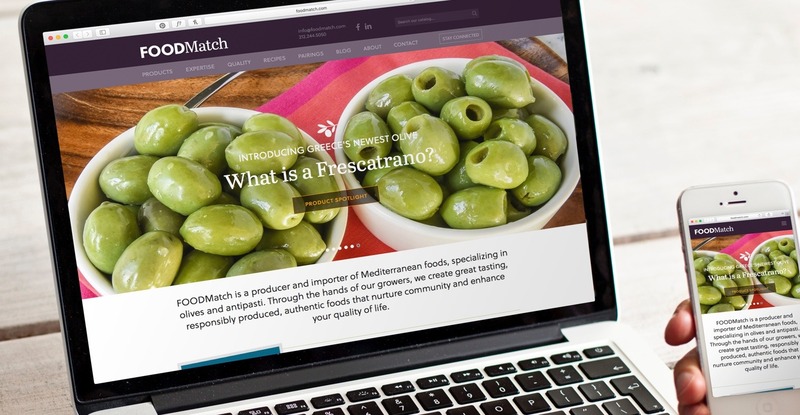 FOODMatch needed a new website as a destination for partners, distributors and consumers alike. And, being that we enjoy olives way more than is normal, we were a perfect fit. We have worked with Look North for a few years and we couldn’t be happier with the quality of work and customer service. These guys are nuts about olives - and so are we. FOODMatch asked us to help create a website that showcased their wide range of products (which of course we had to sample first). What we delivered is a content managed, responsive website that brought all of their brands under a single roof. Sales and marketings teams use the site to deliver product information to customers and partners alike. And, an easy to use control panel helps them keep the site fresh and seasonal. Simple contact forms collect inquiries effectively. The FOODMatch catalog is large and many of the products are available in a variety of styles and packaging. To help vistors learn more about products they might be interested in, conext-relevant calls to action on the individual product pages route information requests to the appropriate teams. This keeps phone calls to a minimum while customers can get the information they need quickly. Not sure what to serve with the olives you just picked up? Trust the experts. Part of the fun with the types of products FOODMatch sells is that they're often served as an appetizer or to accompany a main dish. To help visitors best enjoy them we created this handy pairings guide. Simply choose your product and see what cheese, charcuterie, wine, beer or other good stuff goes best with it. A site designed for chefs browsing on iPads, cooks from their phones. A responsive design for today's brands is essential. People will visit the site from a wide range of devices so it needs to be ready. With a good portion of the FOODMatch traffic coming from mobile phones we created a responsive design that works great regardless of the device. The design of the website reflects the brand and conveys the rich, authentic feel of the Mediterranean countryside. FOODMatch products are perfect for creating appetizing, healthy meals. FOODMatch had an extensive library of recipes that use their products as either the main or supportive ingredient in delicious meals. We created a system of categorization and implemented a search tool to make finding specific recipes quick and easy. And, by linking ingredients to the product pages visitors can get detailed nutritional information. All the product information in a one page PDF. Using ExpressionEngine we are able to take the same product information from the website and package it up into a PDF for downloading. This had helped streamline backoffice operations and save the marketing and sales team quite a bit of time. Again extending the functionality of the site using ExpressionEngine we created a Portal for sample requests from current customers to also save time and increase efficiency for the QA team. With a slick shopping cart-like approach products, supplies and marketing materials can be quickly searched and requested. See what we can do for your project. Sign up for our mailing list to get Look North and industry news delivered to you. Copyright 2019 Look North Inc. All right reserved. All work copyright respective clients.